Bodies of Difference chronicles the compelling story of disability's emergence as an area of significant sociopolitical activity in contemporary China. 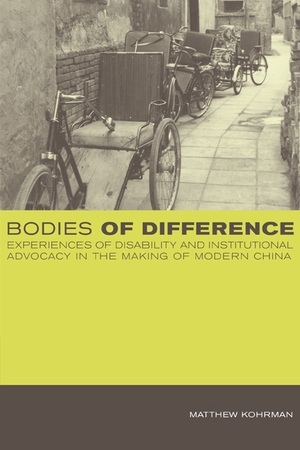 Keenly attentive to how bodies are embedded in discourse, history, and personal exigency, Matthew Kohrman details ways that disability became a fount for the production of institutions and identities across the Chinese landscape during the final decades of the twentieth century. He looks closely at the creation of the China Disabled Persons' Federation and the lives of numerous individuals, among them Deng Pufang, son of China's Communist leader Deng Xiaoping. Matthew Kohrman is Associate Professor of Cultural and Social Anthropology at Stanford University.